One of the true originals in quad bladed spinnerbaits. The Super Shad has a unique profile which mimics a school of fleeing baitfish that predator fish can't resist...!!!! BOOYAH spinnerbaits have just the right action to lure in the big fish, and BOOYAH fishing jigs are versatile enough to fish year round. 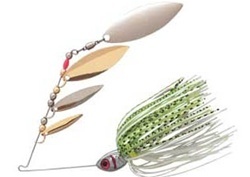 Plus, these enticing fishing baits come in just the right colors and profiles to get the best results. If you love bass fishing and can't resist the heart-pounding thrill of reeling in the big ones, BOOYAH is your brand of spinnerbait.